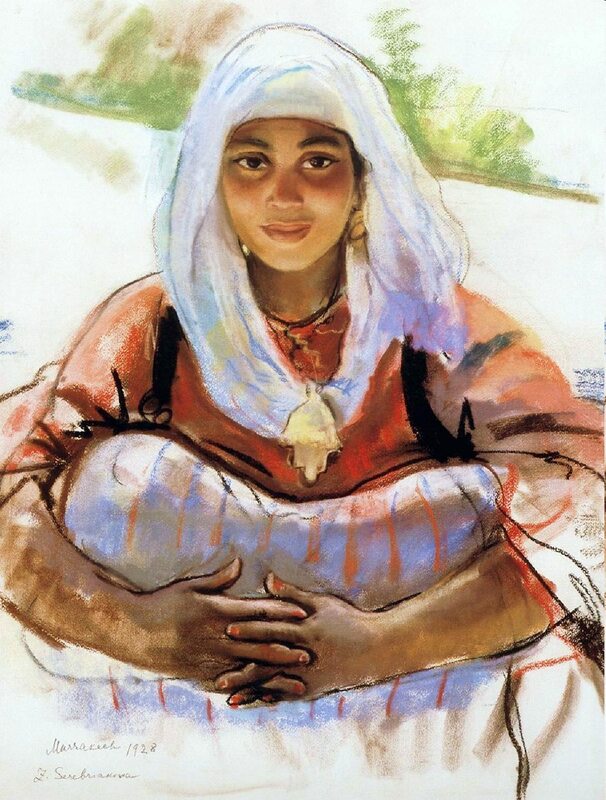 Zinaida Yevgenyevna Serebriakova (née Lanceray) (1884 – 1967) was a Russian (later French) painter. 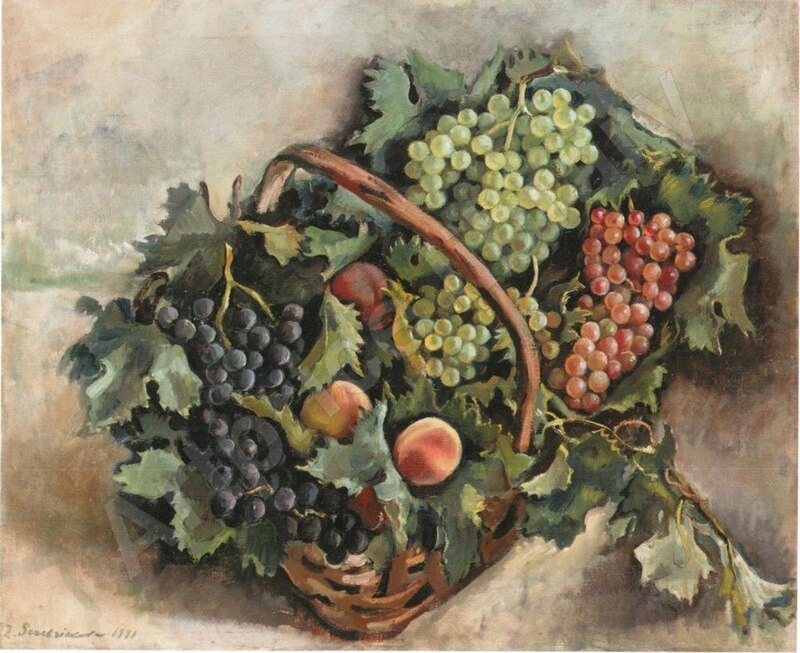 Zinaida Serebriakova was born on the estate of Neskuchnoye near Kursk into one of the most refined and artistic families in the Russian Empire. 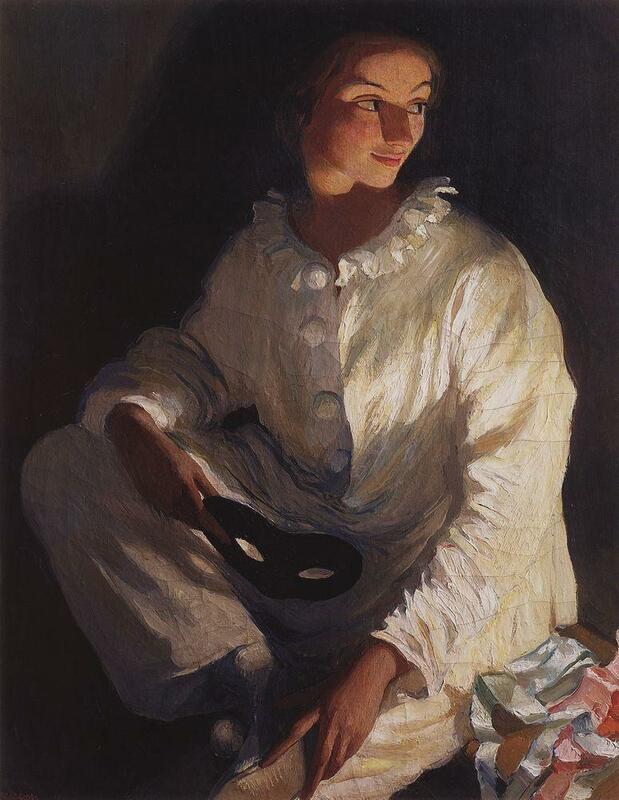 She belonged to the artistic Benois family. Her grandfather, Nicholas Benois, was a famous architect, chairman of the Society of Architects and member of the Russian Academy of Science. Her uncle, Alexandre Benois, was a famous painter, founder of the Mir iskusstva art group. 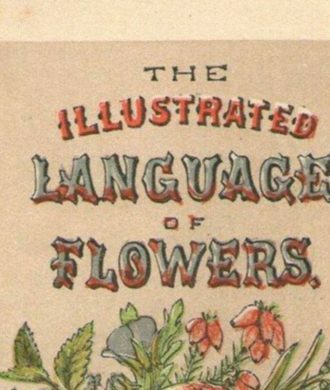 Her father, Yevgeny Nikolayevich Lanceray, was a well-known sculptor, and her mother, who was Alexandre Benois’ sister, had a talent for drawing. 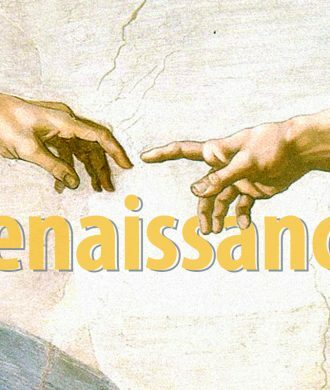 One of Zinaida’s brothers, Nikolay Lanceray, was a talented architect, and her other brother, Yevgeny Yevgenyevich Lanceray, had an important place in Russian and Soviet art as a master of monumental painting and graphic art. The Russian-English actor and writer Peter Ustinov was also related to her. 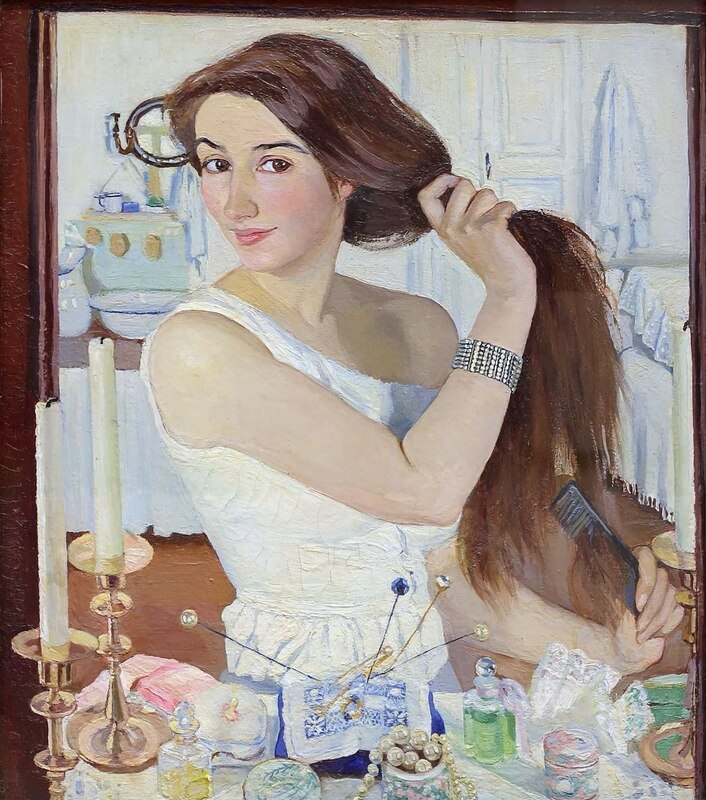 Broad public recognition came with Serebriakova’s self-portrait At the Dressing-Table (1909, Tretyakov Gallery), first shown at a large exhibition mounted by the Union of Russian Artists in 1910. 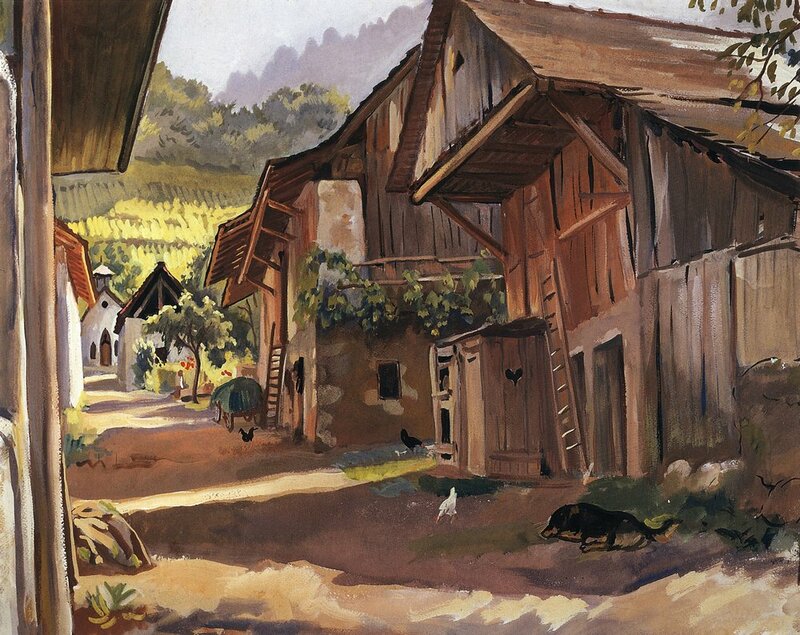 She joined the Mir iskusstva movement in 1911, but stood out from the other members of the group because of her preference for popular themes and because of the harmony, plasticity and generalized nature of her paintings. 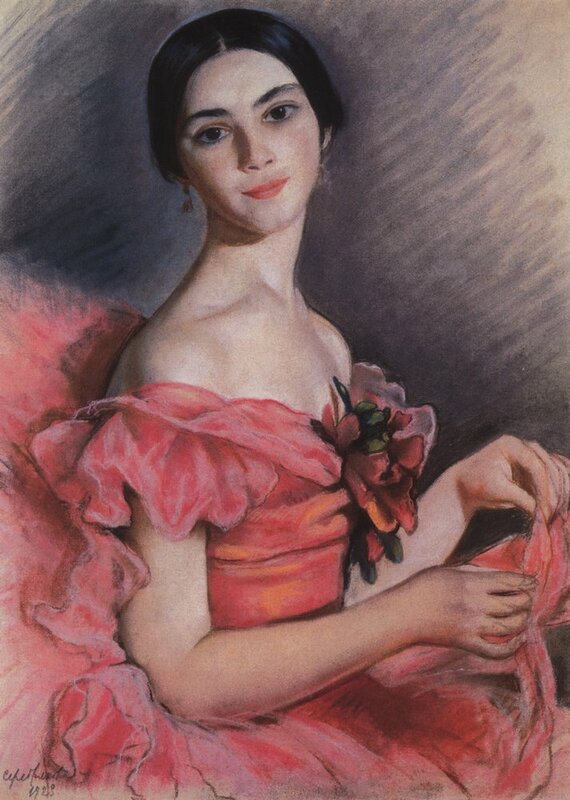 In 1914–1917, Zinaida Serebriakova was in her prime. 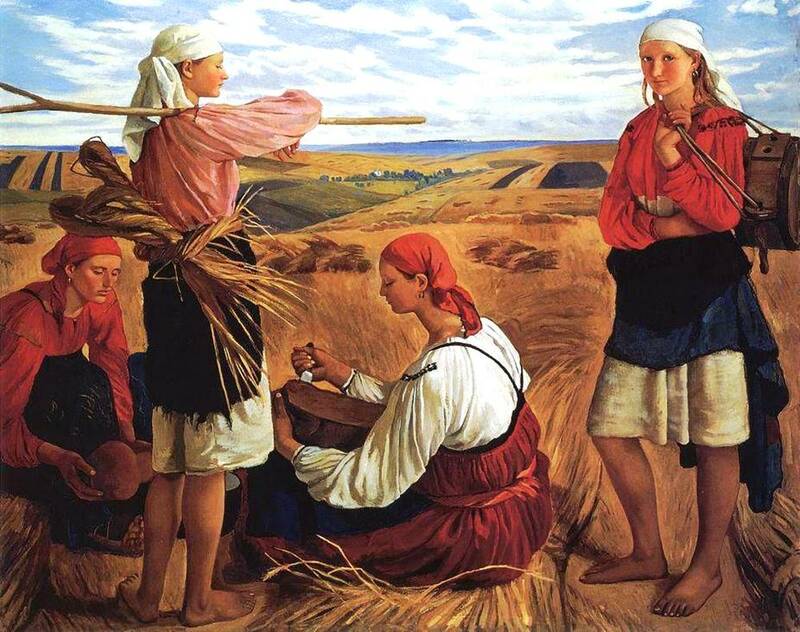 During these years she produced a series of pictures on the theme of Russian rural life, the work of the peasants and the Russian countryside which was so dear to her heart. When in 1916 Alexander Benois was commissioned to decorate the Kazan Railway Station in Moscow, he invited Yevgeny Lanceray, Boris Kustodiev, Mstislav Dobuzhinsky, and Zinaida Serebriakova to help him. 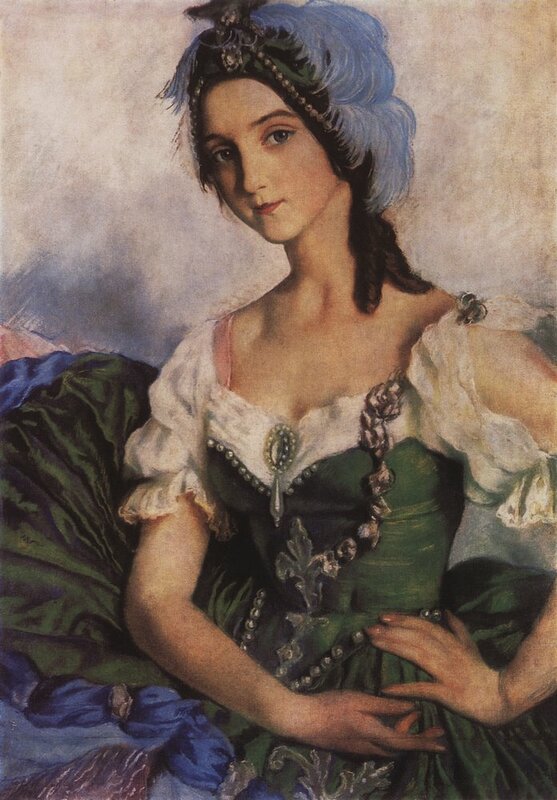 Serebriakova took on the theme of the Orient: India, Japan, Turkey, and Siam are represented allegorically in the form of beautiful women. 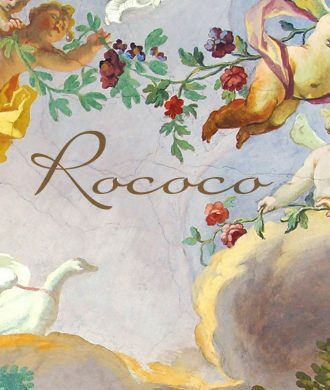 At the same time she began compositions on subjects from classical mythology, but these remained unfinished. 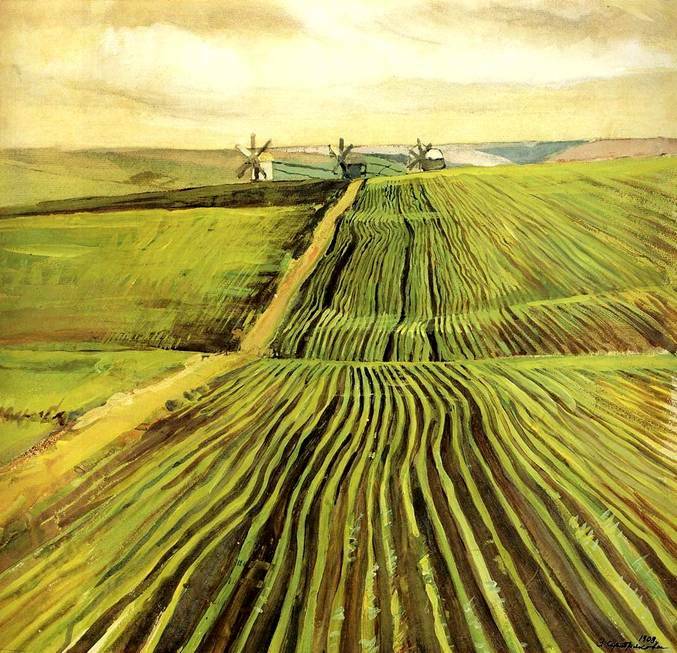 At the outbreak of the October Revolution in 1917, Serebriakova was at her family estate of Neskuchnoye, and suddenly her whole life changed. 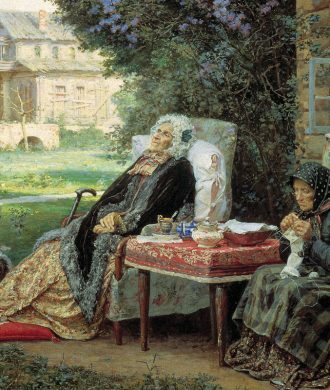 In 1919 her husband Boris died of typhus contracted in Bolshevik jails. She was left without any income, responsible for her four children and her sick mother. All the reserves of Neskuchnoye had been plundered, so the family suffered from hunger. She had to give up oil painting in favour of the less expensive techniques of charcoal and pencil. 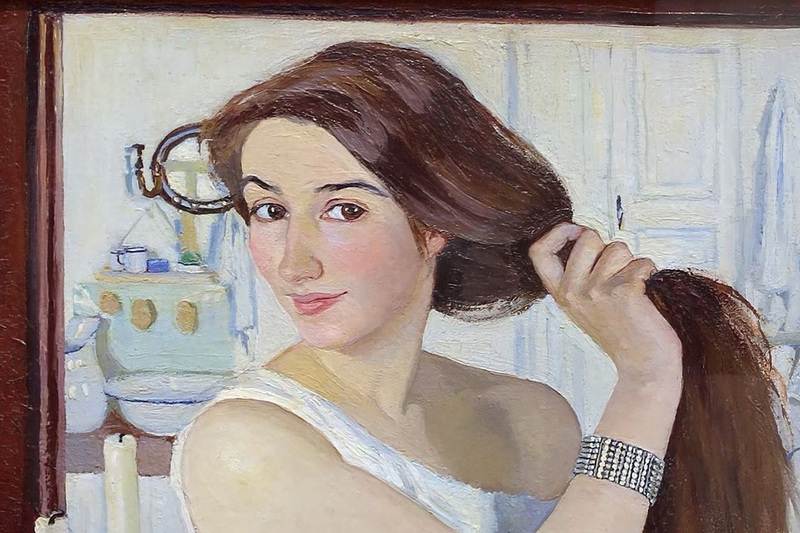 She did not want to switch to the futurist style popular in the art of the early Soviet period, nor paint portraits of commissars, but she found some work at the Kharkov Archaeological Museum, where she made pencil drawings of the exhibits. 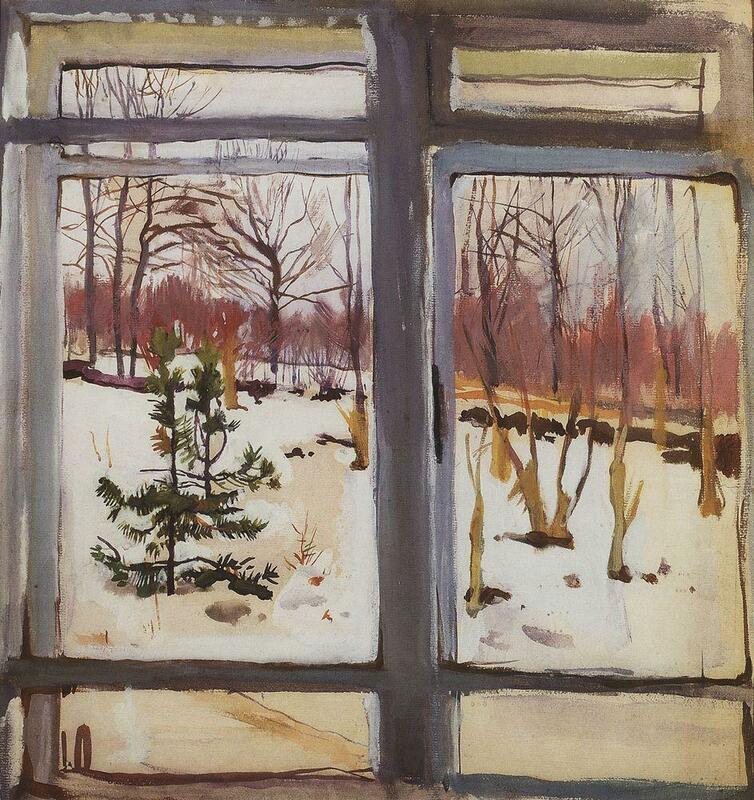 In December 1920 she moved to her grandfather’s apartment in Petrograd. 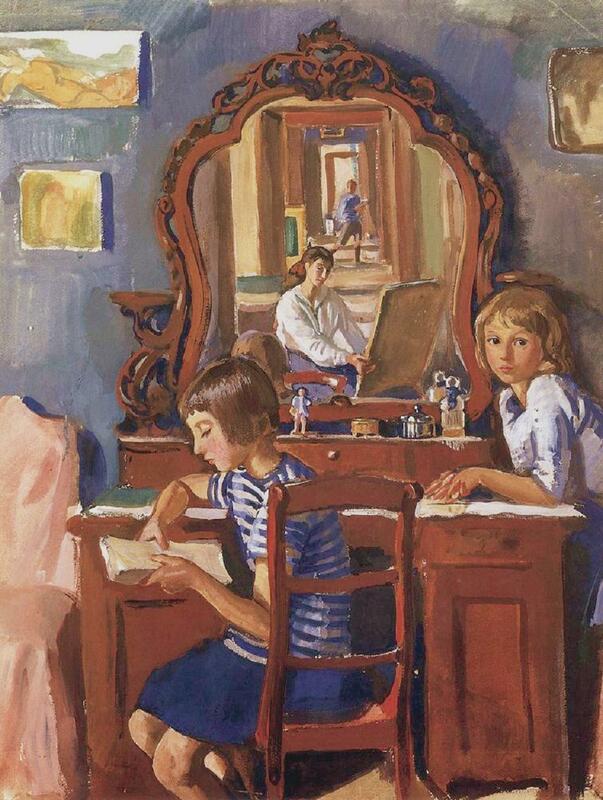 After the October Revolution, inhabitants of private apartments were forced to share them with additional inhabitants, but Serebriakova was lucky – she was quartered with artists from the Moscow Art Theatre. 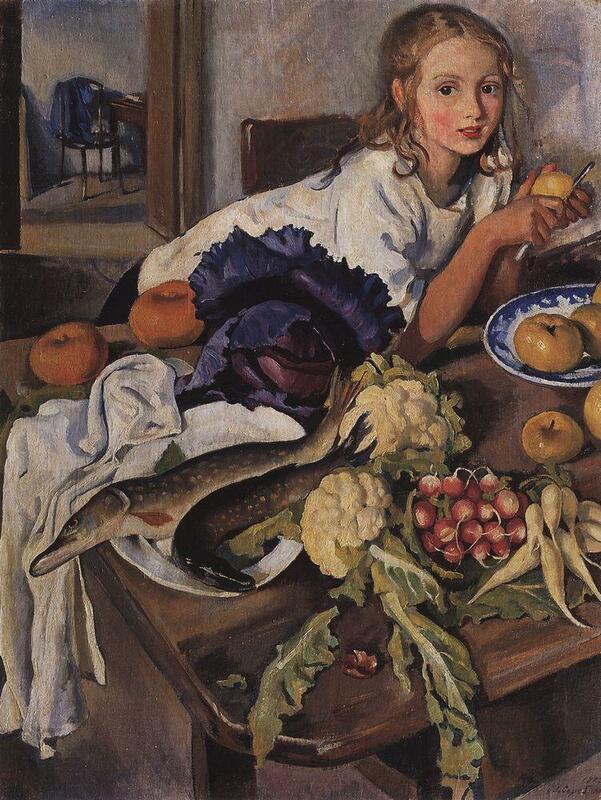 In the autumn of 1924, Serebriakova went to Paris, having received a commission for a large decorative mural. 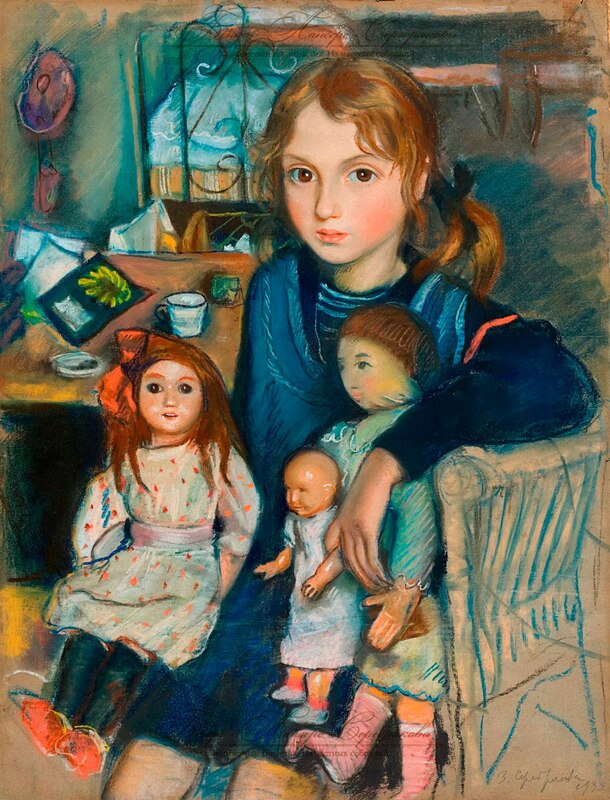 On finishing this work, she intended to return to the Soviet Union, where her mother and the four children remained. 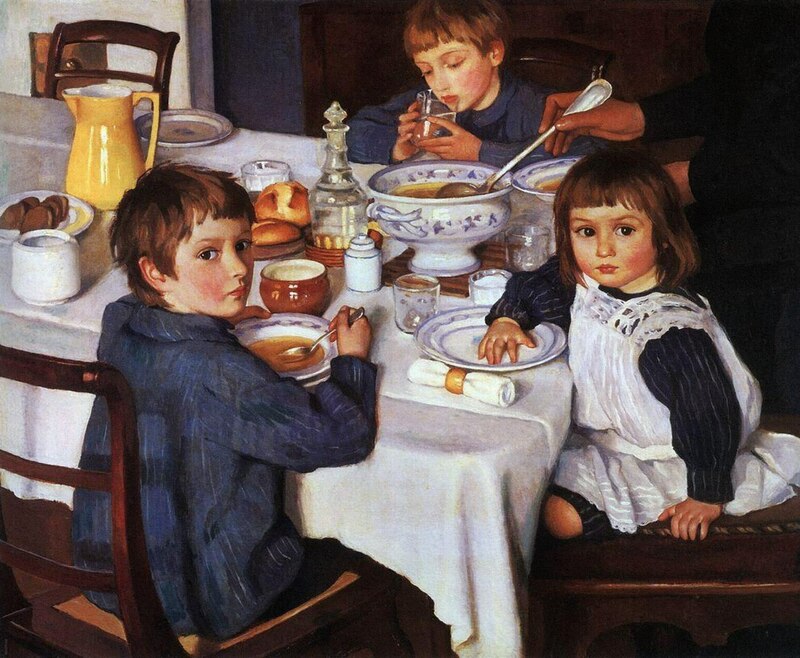 However, she was not able to return, and although she was able to bring her younger children, Alexandre and Catherine, to Paris in 1926 and 1928 respectively, she could not do the same for her two older children, Evgenyi and Tatiana, and did not see them again for many years. 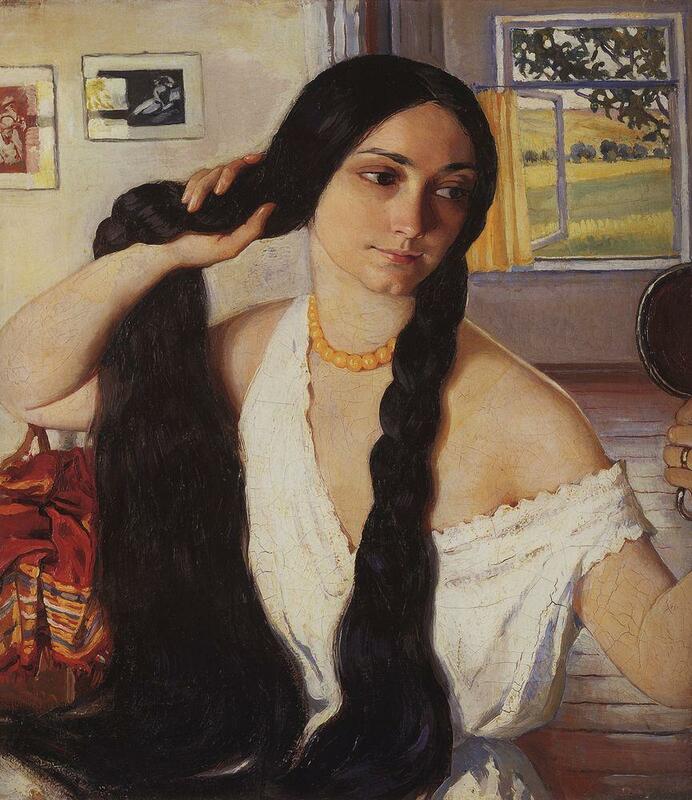 After this, Zinaida Serebriakova traveled a great deal. In 1928 and 1930 she traveled to Africa, visiting Morocco. 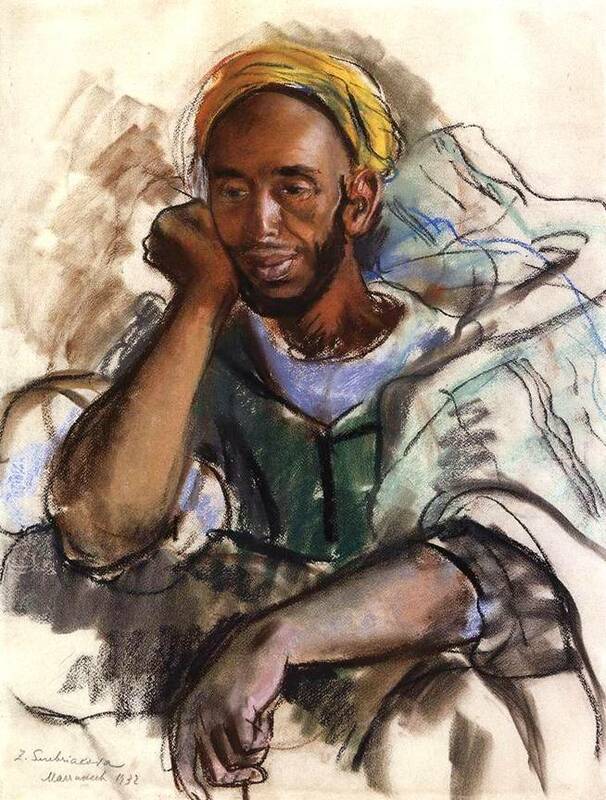 She was fascinated by the landscapes of northern Africa and painted the Atlas mountains, as well as Arab women and Africans in ethnic clothing. She also painted a cycle devoted to Breton fishermen. 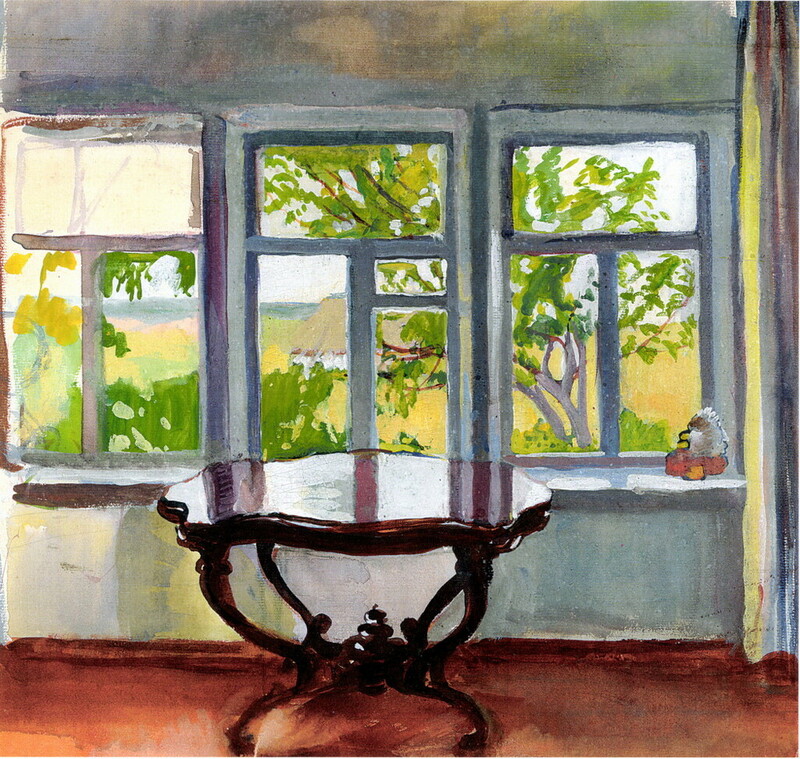 The salient feature of her later landscapes and portraits is the artist’s own personality — her love of beauty, whether in nature or in people. 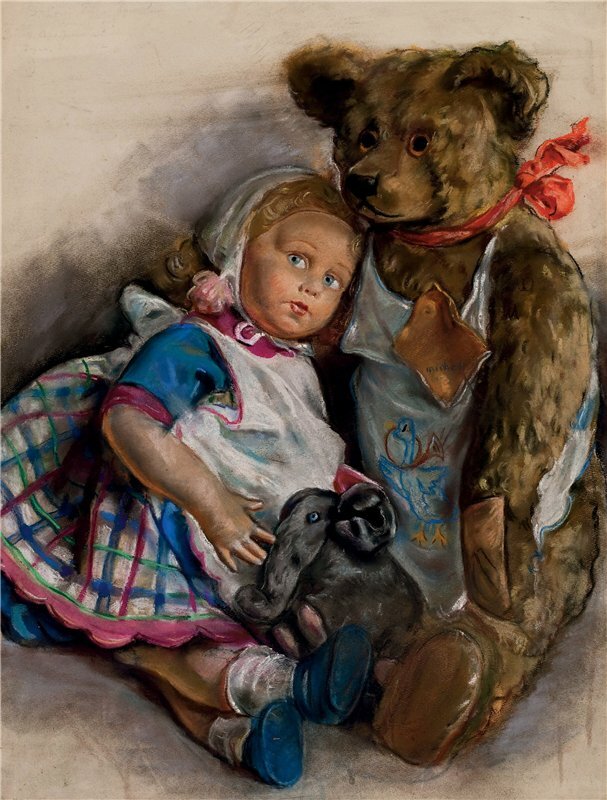 In 1947, Serebriakova at last took French citizenship, and it was not until Khruschev’s Thaw that the Soviet Government allowed her to resume contact with her family in the Soviet Union. In 1960, after 36 years of forced separation, her older daughter, Tatiana (Tata), was finally allowed to visit her. 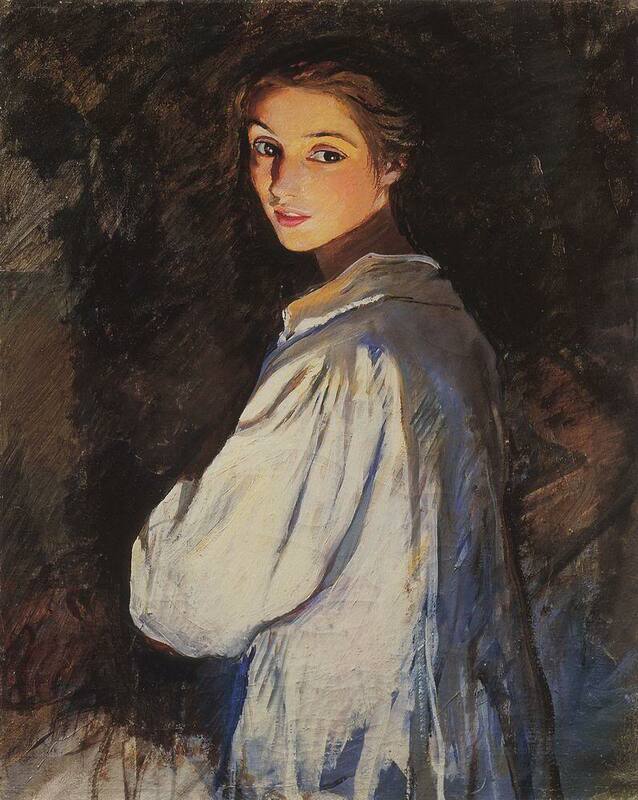 Zinaida Serebriakova’s works were finally exhibited in the Soviet Union in 1966, in Moscow, Leningrad, and Kiev, to great acclaim. 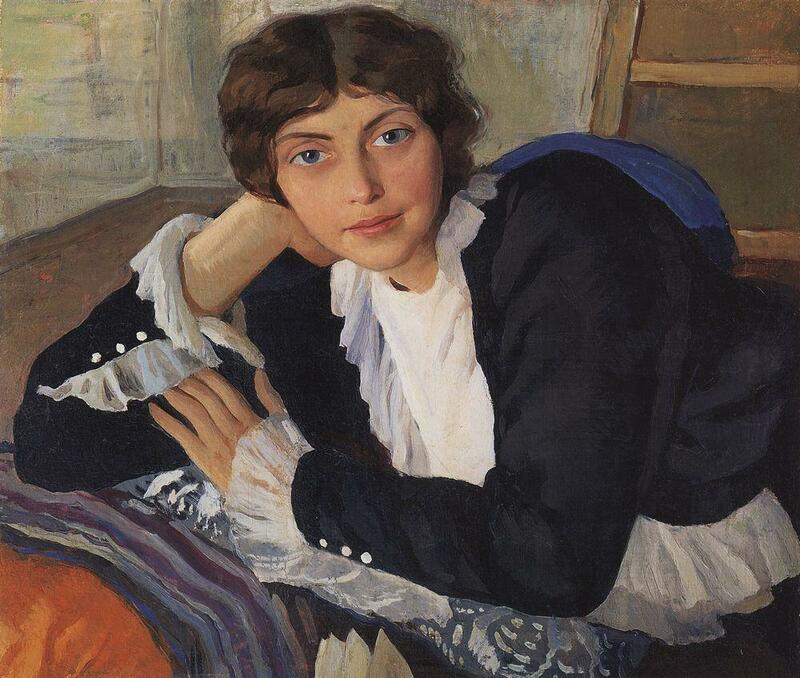 Zinaida Serebriakova died in Paris on 19 September 1967, at the age of 82. She is buried in Paris, at the Russian cemetery at Sainte-Geneviève-des-Bois.